Is there a non-chemical odor removal system that works to remove rotten-egg odor from well water? My well water really stinks. – 15 minute backwash every other day during which it draws in air. As the water flows into the Air Charge System, the odors come in contact with the air, which oxidizes the odors. The special odor removal filter media then completely removes all odors. 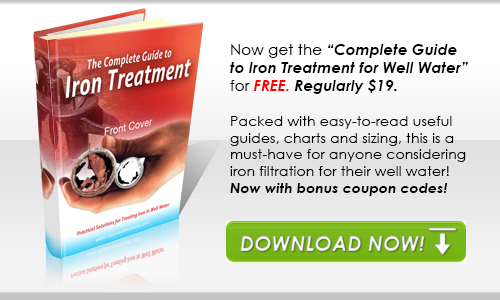 This system also does a great job in removing iron. The result is clean iron-free water free of odor, though out the home. It’s easy to install and is fully automatic. This is one option, typically good for a home with 1.5 to say 3 or 3.5 bathrooms. How the system works: The AIO air filter maintains an “air pocket” in the top of the tank while the system is in service. As water passes through the air pocket, iron and sulfur are oxidized. The AIO filter media bed then removes the oxidized iron and sulfur from the water. Additionally, dissolved oxygen is added to the water. By utilizing a patented piston in the control valve, the AIO Iron/Sulfur filter is able to put the whole oxidation process inside one tank, keeping maintenance costs and down time to a minimum. Excellent Warranty: 5 years on the Control Valve & 10 years on the media tank as well.